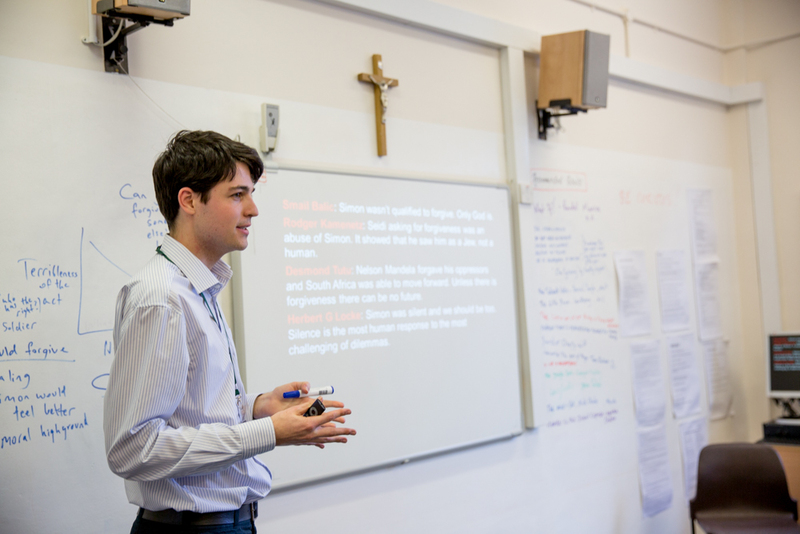 The philosopher Steven Campbell-Harris came to St Benedict’s once again, to lead challenging discussions on complex questions. 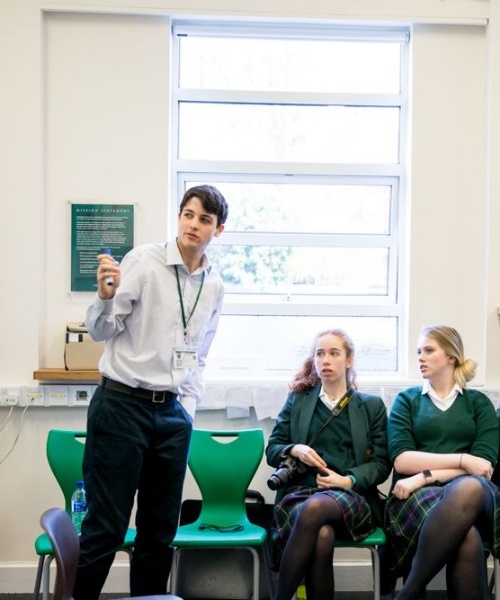 Mr Campbell-Harris led a number of sessions for St Benedict’s Academic Scholars and Gifted and Talented pupils from Form 3 (Year 7) to Upper 5th (Year 11). Discussions and thinking games challenged pupils to think more clearly, more deeply, and to explain and justify exactly what they are saying. Whether or not the group reached a final decision on if animals are different to humans is debatable, but what is clear is that the Wojtyla group had an extremely thought-provoking and engaging discussion with the philosopher Steven Campbell-Harris. In just an hour we dived into the murky waters of the question that Plato tried to answer so long ago, “Is there a difference between humans and animals?” We considered logical thinking, morality, society, and knowledge of the existence of North Korea in our trek, pondering if these were true differences or just differences to a degree. Thoughts, ideas and concepts were thrown around, agreed upon and then refuted. A lively debate grew, changing so that it focused on whether speciesism (humans considering themselves better than other animals) was justified and if we should all really be vegetarians. Although we never came to a group agreement, I think we may have come up with a deeper definition of a human than Plato, who said a human was merely a two legged, featherless animal. I really enjoyed the Upper 4th Philosophy Workshop as it got me thinking more deeply. I liked considering all parts of the example/problem and trying to sum up my opinion in a short but complex answer. Usually, I just try to understand a concept then move on, but here I really had to look into and analyse meaning and what the intention and consequences show about an action. I also liked hearing other people’s views about morality and things like utilitarianism. The philosophy talk that I took part in was extremely interesting. It has deepened the way I think about things and will change my life as now I see what a philosopher does. The question was about ‘slow berries’ - a berry in a world where everyone is fast, and if consumed, would make you and your brain slow down. Mr Campbell-Harris posed the question: if a minority didn’t eat them, but the majority did because the berries were very tasty, would you ban the berries? We gave many valid reasons why we should and shouldn’t ban them, but we also came up with alternatives such as artificial substances that have the same taste as the berries but with no slowing effect. Overall, I feel all who took part in this talk had their meaning of life developed and a greater understanding of what a philosopher does. When the philosopher came in he was asking “What is Ownership?” He made us talk about whether ownership is buying something. Or maybe ownership is something you physically have in your grasp. It really made people think about ownership in a different light because before this talk I didn’t really think about ownership at all. People found the discussion interesting and enjoyable.